For Sany America, the US subsidiary of China’s largest maker of construction equipment, 2013 has been a year worth celebrating. The Georgia-based company doubled its sales from last year and has fulfilled this year’s budget profit by more than twofold. Its dealer network has expanded to cover about 65 percent of the US, Canada, and Mexico market, compared to 40 percent in 2012. There are now 32 dealers in 35 US states selling Sany products. The company introduced a new machine specifically designed for the North American market – an 85-ton tough-terrain crawler crane. It also started selling port equipment this year. And, Sany America recruited a new CEO, Mike Rhoda, a veteran executive whose recent titles include president of Volvo’s excavator business line. “I have been following Sany for several years while working for other competitors and I’ve been impressed with their ambition and aspirations,” Rhoda told China Daily. In April of this year, Sany Group, which owns Sany America, surpassed Liebherr to become the world’s fifth-largest construction equipment manufacturer, after Caterpillar, Komatsu, Hitachi and Volvo, according to the International Construction magazine. Rhoda said he was particularly impressed with Liang Wengen, chairman of the Sany Group. According to the 2013 Forbes Billionaires List, Liang is the third-richest person in China. “Liang seems very open to, first of all, understanding how business is done in other parts of the world, and then working to make the kind of changes that are necessary to adapt to those differences,” said Rhoda. Sany’s plant in suburban Atlanta, started in 2006, was an investment of $60 million, the largest of Sany Group’s five overseas operations. The building houses 60,000 square feet of office space and 340,000-square feet of manufacturing space. Employing about 100 people, Sany America is the largest manufacturing investment from China in Georgia. The company started with concrete-pumping equipment and crawler cranes. The concrete pump operation was later moved to a Wisconsin factory owned by German construction company Putzmeister Holding GmbH, which Sany Group bought in April last year. It wasn’t until October 2012, seven years after Sany first set foot in the US, that the company turned its first profit. Sany America has reported a profit each month since. Jack Tang, former president of Sany America, who departed in December to lead Sany’s other business ventures in the US, attributes the breakthrough to the company’s consistent investment in research and development with the goal of tailoring its products for the North America market. Tang said US government agencies and customers have high safety standards and demand high efficiency. 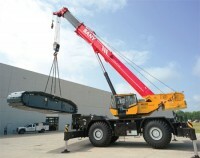 Tang is particularly proud of the company’s newest model, the SRC885, the 85-ton rough-terrain crane. “There are already 70-ton and 100-ton products on the market. We learned through research that many customers in fact needed a model that could fill the gap and do the job on both ends,” said Tang. The machine now takes a 20 percent market share of similar models. Sany America has gradually refined its product lines. It now devotes main resource in assembling excavators. With dealer network constantly expanding, the facility also has become a testing and training center for dealers. Kirk Erlinger, director of sales and dealer development at Sany America, said he takes pride in the quality of Sany’s products. “My goal is to continue to introduce high-quality Chinese products that can complete globally,” said Erlinger, who joined the company two years ago after working for crane dealers for more than 20 years. “I know what our dealers are going through, so I am more capable of understanding the challenges they face,” said Erlinger. He oversees five salesmen, all locally hired. Building dealer satisfaction is also CEO Rhoda’s goal. “As we work with our existing and future dealers, we want to establish a high level of satisfaction with the Sany brand,” he said. Having most recently worked as chief technology officer for Doosan International, a Korean multinational in construction equipment, and having spent five years in China working for Ingersoll Rand, Rhoda said he has reached a level of understanding of some of the cultural differences that Chinese and Asian companies run into dealing with countries and companies in the West. Sany’s name has been associated with an order signed by US President Barack Obama in September of last year blocking the sale of four wind farms near a US Navy testing compound in Oregon to Ralls Corp, citing national security concerns. Two Sany Group executives had bought Delaware-based Ralls earlier to invest in wind energy by installing Sany turbines. Sany has since sued President Obama, demanding to know the reasons behind the order. A district judge later ruled that Sany is not entitled to be informed of the grounds for the president’s decision. Rhoda will start his new year in China, attending meetings at Sany’s Beijing headquarters. “I hope to establish good relations with the leaders of Sany’s different business units as well as some of the board members. We will be discussing specific areas in the crane, excavator and port equipment business,” he said.